"Not your everyday backyard burger, but a true celebration of summer! Right from Bayou Sam's Cajun Grill. Serve with Zapp's Cajun Chips Pecos Sweet cantaloupe, and well-chilled Black Diamond watermelon hearts. Enjoy the summer while you can." Mix together the ground beef and roasted garlic. Form the mixture into four balls, and flatten into patties about 3/4 inch thick. Sprinkle the patties with garlic pepper, lemon salt, and Cajun seasoning. Lightly oil the grilling surface. Place onions on the grill, and toast on both sides. Place beef patties on the grill, and set the onions on top of them. Grill for about 5 minutes on each side, or to desired doneness. If you're lucky (or trashy) enough to still have a coffee can of grease on your stove, brush both sides of the Hawaiian rolls, then toast them on the grill. 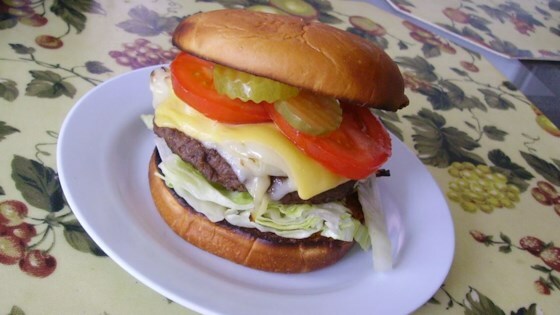 To assemble, place the patties on buns, and top with slices of American and Edam cheese, lettuce, tomato, pickles, and your choice of condiments such as ketchup, Creole mustard, and salad dressing. These listed are some of mine. These aren't too bad. The recipe looks like alot, but it really isn't. Not too bad. A nice break from the same ol same ol. We all enjoyed these. Will make them again. They go good with the Tail burner firehouse french fry recipe on this site.